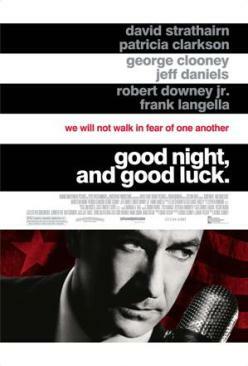 In 2005 an American drama film “Good Night, and Good Luck” was released. Written by George Clooney and Grant Heslov and portrays the conflict between veteran radio and television journalist Edward R. Murrow and U.S. Senator Joseph McCarthy of Wisconsin. The film especially relates to the anti-Communist Senator’s actions with the Senate Permanent Subcommittee on Investigations. The film was filmed in color, but in order to use archival footage of the period, which was black and white, the color was rendered as grayscale. The title of the movie was the signature signoff that Edward R. Murrow routinely used to sign off his broadcasts. Although the movie was a low budget movie it ended up being nominated for six Academy Awards. George Clooney was paid $1 million each for writing, directing, and acting in Good Night, and Good Luck. The movie cost $7.5 million to make. Clooney couldn’t pass the tests to be insured due to an earlier injury so he then proposed to mortgage his house in order to make the film. However, Dallas Mavericks owner Mark Cuban and former eBay president Jeff Skoll invested money in the project as executive producers. The film ultimately grossed more than $54 million worldwide. The film is framed by performance of the speech given by Murrow to the Radio and Television News Directors Association in 1958, in which Murrow harshly admonishes his audience not to squander the potential of television to inform and educate the public. In September 2005, Clooney explained his interest in the story to an audience at the New York Film Festival: “I thought it was a good time to raise the idea of using fear to stifle political debate.” Having majored in journalism in college, Clooney was well-versed in the subject matter. His father, Nick Clooney, had been a television journalist for many years. The elder Clooney had also ran for congress in 2004. The film was critically acclaimed upon release. It was named “Best Reviewed Film of 2005 in Limited Release” by Rotten Tomatoes, where it achieved a 94% positive review rating. The movie received six Academy Award nominations, including Best Picture, Director (Clooney), and Actor (Strathairn). One complaint about the film among test audiences was their belief that the actor playing McCarthy was too over the top, not realizing that the film used actual archive footage of McCarthy himself. By far the most critical was McCarthy biographer M. Stanton Evans. 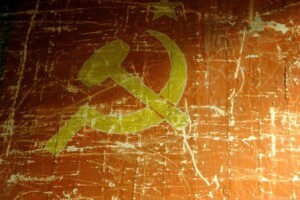 According to Evans, the film knowingly concealed the fact that the victim of McCarthy persecution—central to the Murrow episode and thus the movie’s plot—was indeed a member of the Communist Party. Annie Lee Moss is shown in the movie indignantly denying the charge before McCarthy’s subcommittee, and the impression of her innocence is left to stand with viewers. Edward R. Murrow: We’ll split the advertising, Fred and I. He just won’t have any presents for his kids at Christmas. Sig Mickelson: He’s a Jew. Edward R. Murrow: Well don’t tell him that. He loves Christmas. Sig Mickelson: In 1935, Ed Murrow began his career with CBS. When World War II broke out, it was his voice that brought the Battle of Britain home to us, through his “This Is London” radio series. He started with us all, many of us here tonight, when television was in its infancy, with the news documentary show, “See It Now.” He threw stones at giants. Segregation, exploitation of migrant workers, apartheid, J. Edgar Hoover, not the least of which, his historical fight with Senator McCarthy. He is the host of our enormously popular show, “Person to Person,” and tonight he is here with is son, Casey, wife, Janet, and all of you who he’s worked with, inspired, lectured, and taught. Ladies and gentlemen, the Radio-Television News Directors Association and Foundation welcomes Mr. Edward R. Murrow. Edward R. Murrow: We will not walk in fear, one of another. Edward R. Murrow: No one familiar with the history of his country, can deny that congressional committees are useful. It is necessary to investigate before legislating. But the line between investigating and persecuting is a very fine one, and the Junior Senator from Wisconsin has stepped over it repeatedly. His primary achievement has been confusing the public mind as between the internal and the external threats of communism. We must not confuse dissent from disloyalty. We must remember always, that accusation is not proof, and that conviction depends upon evidence and due process of law. We will not walk in fear, one of another, we will not be driven by fear into an age of unreason. If we dig deep into our history and our doctrine, we will remember we are not descended from fearful men. Not from men who feared to write, to speak, to associate, and to defend causes that were for the moment unpopular. This is no time for men who oppose Sen. McCarthy’s methods to keep silent or for those who approve. 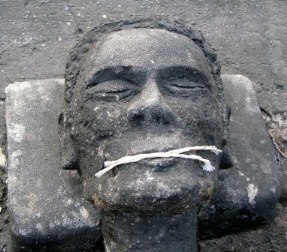 We can deny our heritage and our history but we cannot escape responsibility for the result. There is no way for a citizen of the republic to abdicate his responsibilities. As a nation we have come into our full inheritance at a tender age. We proclaim ourselves as indeed we are, the defenders of freedom wherever it still exists in the world. But we cannot defend freedom abroad by deserting it at home. The actions of the Junior Senator from Wisconsin have caused alarm and dismay amongst our allies abroad and given considerable comfort to our enemies. And whose fault is that? Not really his, he didn’t create this situation of fear, he merely exploited it, and rather successfully. Cassius was right, the fault dear Brutus is not in our stars, but in ourselves. Good night, and good luck. 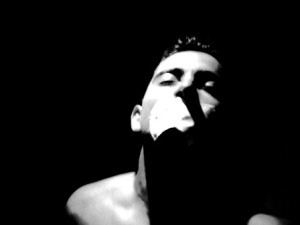 Edward R. Murrow: Funny thing, Freddie, every time you light a cigarette for me, I know you’re lying. Fred Friendly: There’s no news, boys, so go out there and make some news. Rob a bank, mug an old lady, whatever – just do something. Edward R. Murrow: You always were yellow. Fred Friendly: Better than red. Sig Mickelson: [to Murrow] Go after Joe Kennedy, I’ll pay you for that. William Paley: There’s a Knickerbocker game tonight, I’ve got front row seats. Are you interested? Edward R. Murrow: I’m a little busy bringing down the network tonight, Bill. Edward R. Murrow: He’s gonna hope a senator trumps a newsman. Edward R. Murrow: Not if we’re playing bridge. Edward R. Murrow: Let us dream to the extent of saying that on a given Sunday night the time normally occupied by Ed Sullivan is given over to a clinical survey of the state of American education, and a week or two later the time normally used by Steve Allen is devoted to a thoroughgoing study of American policy in the Middle East. Edward R. Murrow: It is my desire if not my duty to try to talk to you journeymen with some candor about what is happening in radio and television, and if what I say is responsible, I alone am responsible for the saying of it. Our history will be what we make of it. And if there are any historians about fifty or a hundred year from now, and there should be preserved the kinescopes of one week of all three networks, they will there find, recorded in black and white and in color, evidence of decadence, escapism, and insulation from the realities of the world in which we live. We are currently wealthy, fat, comfortable, and complacent. We have a built in allergy to unpleasant or disturbing information; our mass media reflect this. But unless we get up off our fat surpluses, and recognize that television, in the main, is being use to distract, delude, amuse, and insulate us, then television and those who finance it, those who look at it, and those who work at it, may see a totally different picture, too late. Edward R. Murrow: To those who say people wouldn’t look; they wouldn’t be interested; they’re too complacent, indifferent and insulated, I can only reply: There is, in one reporter’s opinion, considerable evidence against that contention. But even if they are right, what have they got to lose? Because if they are right, and this instrument is good for nothing but to entertain, amuse and insulate, then the tube is flickering now and we will soon see that the whole struggle is lost. This instrument can teach, it can illuminate; yes, and it can even inspire. But it can do so only to the extent that humans are determined to use it to those ends. Otherwise it is merely wires and lights in a box. Good night, and good luck.